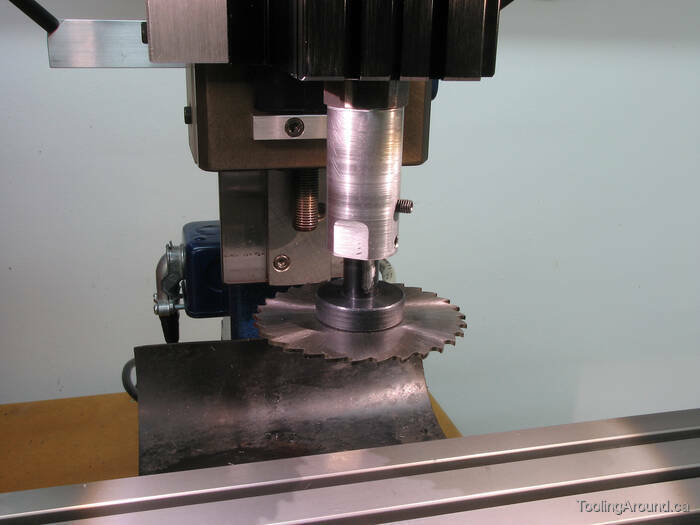 The Taig mill's ER-16 spindle has a maximum capacity of 10mm. Here in Canada, cutters are commonly available with shanks in fractional inch sizes, such as 1/8″, 3/16″, 1/4″, 5/16″, 3/8″ and 1/2″. Other sizes are available, but the sizes commonly used in industry tend to be the least expensive. Of the sizes listed, ER-16 collets will hold all but the 1/2″ shank size. The photograph (above) shows a slitting saw holder with a 1/2″ shaft, but certain cutters, such as Woodruff key cutters, useful for cutting small T-slots, also have 1/2″ shafts. Taig sells blank arbours with a 3/4-16 thread, which is fine, if you want to screw them on to the lathe spindle nose. However, I wanted to screw one to the ER-16 mill spindle nose, so I started by boring the threaded end to the minor diameter of the thread used on the spindle nose. It's too bad Taig doesn't also supply these arbours with an M22x1.5 thread. The next step was to set up the gear train to cut a 1.5mm thread pitch. Then I was ready to cut the internal thread. The thread was not cut under power. Instead, I used the handwheel that is described here. In order to complete the tool holder, I mounted the mill headstock on the Taig lathe bed. It was easy to move the motor and its mount to the headstock. The bar on the front is for mounting the mill motor. Taig does sell an ER-16 adapter for the lathe spindle, however, I didn't have one at the time. Regardless, I would have moved the mill headstock over anyway, to get the best possible concentricity. To make room for boring, I drilled the arbor to the maximum capacity of the tailstock-mounted drill chuck. I moved the arbor to the drill press, to take advantage of its larger drill chuck. I used successively larger drill bits until ending with a hole that left room for boring to the final size. I drilled holes for two grub screws, so I would have a choice of which to use, depending on the tool. For cutters without a grub screw flat, I can use two grubscrews, to reduce the possibility of slippage, with the resultant damage. Next, I milled flats for a wrench. If you look closely, you'll see that the arbor was sitting just a tiny bit too low in the V-block to permit milling the entire width of the flats. While the arbor was still in the V-block, I tapped the holes for 10-32 grub screws. Here are the wrench flats, after milling. It was a simple matter of using a file to flatten the last bit on each side. This photo shows the quality of the drilled hole, which is not great. The hole was bored to size, meaning that a cutter with a 1/2″ shank is a close sliding fit. As you can see, the bored hole is very clean.